I’ve been reflecting a lot this month – maybe it’s because January began and ended with funerals. Six people in my life passed away over the past 30 days, and to cap it all off, the 31st day marks the 5-year anniversary of my husband’s death. Needless to say, I am really looking forward to flipping the calendar to February! From an elderly family friend who battled for some time with an illness, to a vibrant family member who never recovered from a stroke. To the loss of a friend’s newborn baby boy, to a father of a little girl who felt this life was just too much. To a mother of 2 young children who never came out of a routine procedure, to my 94-year old Great Aunt who lived a very full life – I think it’s time I raise the white flag! Yes, I said a camera. I have pictures from my husband’s funeral. I have pictures of him in his casket and pictures of my kids putting their precious notes, stickers, and yes, even his iPod in with him to have forever. I have pictures from the viewing, the church and even the cemetery. I honestly don’t know what made me think of doing that at the time, but I am so glad I did! I actually should say, I’m very glad my sister agreed to carry out my unusual request! I can’t imagine how awkward that must have been for her. I mean, you never see anyone taking pictures at a funeral! The images she captured from that day though are priceless. I really don’t know if my kids will ever want to see what they put in his casket, or want to know more details from that day, but if they do, I can show them. Maybe they’ll want to know what the church looked like or how his casket was lowered into the ground – or maybe they won’t. What I do know is that the pictures tell a story of love and strength through the loss. People hugging and comforting each other, people smiling and laughing about funny stories and people coming together to pay tribute to a man who fought a very tough battle. I even have a favorite! Yes, I said I have a favorite. We were in church and I was about to deliver Jeff’s eulogy. My plan was to go up there alone but my kids had a different idea. 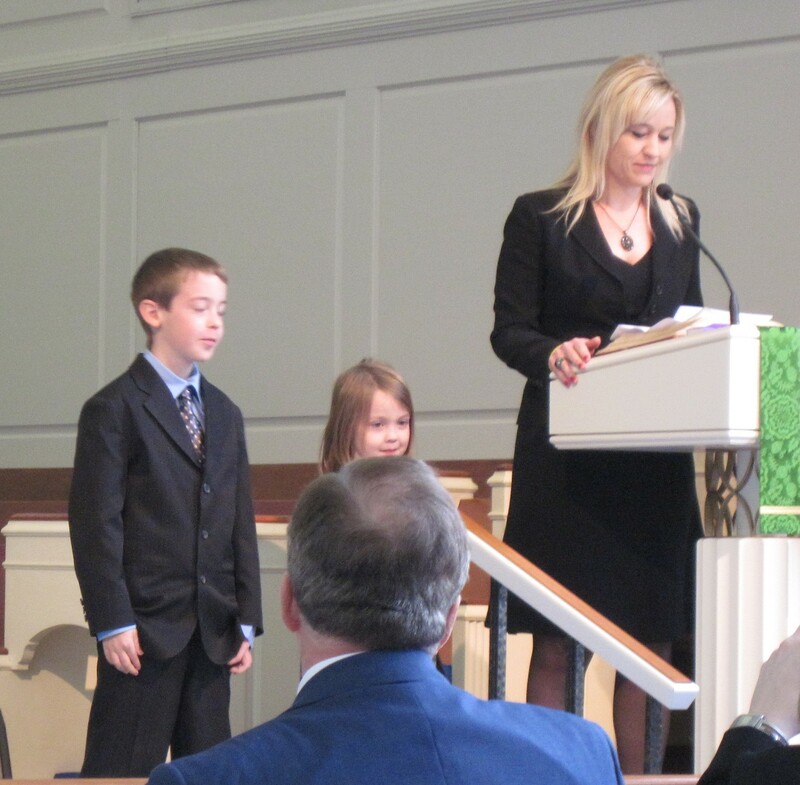 About 30 seconds before I was to speak, my son leaned over and asked if he and his sister could stand up there with me. I must say, delivering that eulogy with my children by my side will always be my proudest moment and I am so thankful I have the picture to prove it! …and hoping to see someone with a camera. Sheila and I share an this view. I love that she focuses on the love and strength of the funeral experience and wants to capture the hugs and sharing of stories in pictures. Yesterday I went to a funeral and the program was full of pictures of a life well lived. Made the experience that much more special.